There can only be one choice for this week’s ‘Sports 360 Supremo’ and a unanimous office decision sees departing Wigan Warriors coach Shaun Wane take the accolade. After serving the club so well in his roles as player, scout, academy coach, assistant coach and eventually head coach over four decades, to bow out with the Super League trophy in his hands was the dream scenario and an utterly brilliant way for ‘Waney’ to bid farewell to the club he loves. A game that won’t live long in the memory as it wasn’t littered with classic moments, but post-match celebrations and interviews that will. Wigan were the better side on the night and deserved the victory, but after first half tries from Josh Charnley, Dom Manfredi and Tom Davies respectively, neither team looked like they really wanted to take the game by the scruff of the neck and decide it one way or the other. A spirited Warrington team guided by outstanding coach Steve Price, had plenty of ball, but a truly tremendous defensive effort from the cherry and whites limited Wire to a single try. The solid platform that the Warriors have been built on throughout Wane’s tenure, meant that if they could nudge themselves seven points in front at any time in the game, they were more than likely to end the night victorious. When Dom Manfredi crossed the white wash for his second try, with only three minutes left on the clock, Wigan Warriors did just that, allowing Shaun Wane and his team to end the season as Champions! 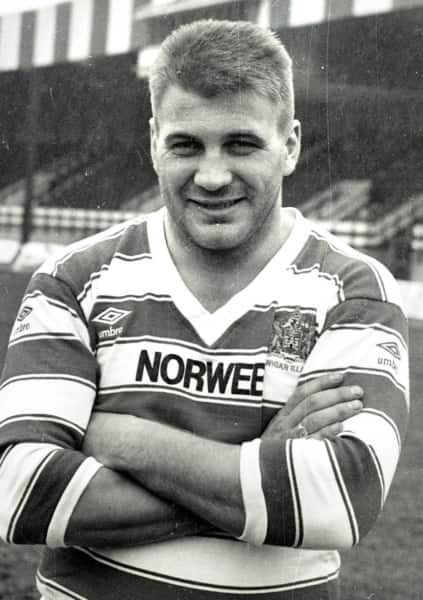 Having played the vast majority of his career in the cherry and white of Wigan and representing Great Britain on a couple of occasions, Wane ended his playing days in colours of Leeds and then Workington Town in 1994. A short break from the game saw the legendary Wiganer re-join his home town club in 2000 in the capacity of scout and then he eventually put the boots back on in 2003, when he became coach of the U18s in Wigan’s famed academy. Having honed his coaching skills with the youngsters, Wane was promoted to assistant coach in 2009, working with former player Paul Deacon, underneath Head Coach Michael Maguire and it was here that the journey of Shaun Wane – Head Coach, began. That dream finally became reality in 2011 when he was appointed head coach of his beloved Warriors and since that day there have been some memorable performances at Old Trafford and against Cronulla Sharks in-particular, collecting every trophy in the game along the way. In his final season, he even managed to pick up the Super League coach of the year award and complete the set. Shaun Wane is not only bidding farewell to the cherry and whites, but also to the sport of rugby league as well, as he takes up a post with Scottish rugby union. History tells us however that this week’s ‘Sports 360 Supremo’ doesn’t stay away from Wigan for long.